Happy Halloween! In the U.S., Halloween is one of the most fun holidays. 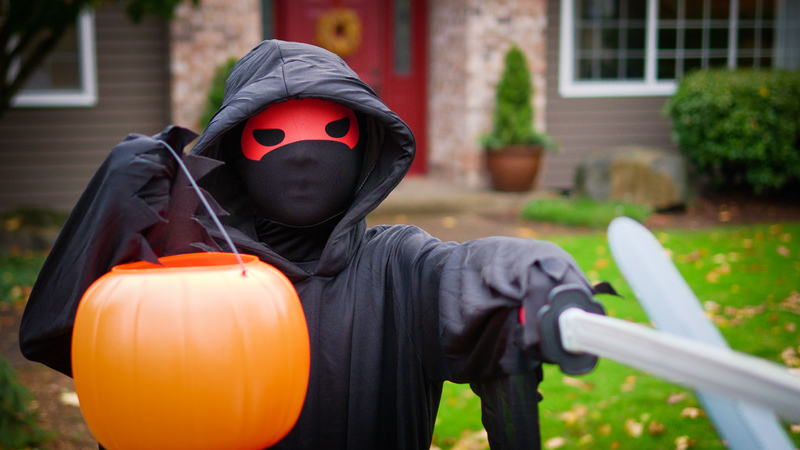 Kids dress up in crazy costumes and consume more sugar than is good for them, and people all over decorate their houses to welcome the madness of trick-or-treating. And you should be ready to make portraits. When you look back at pictures of Halloween, you’re in for a treat — unless you got tricked in bringing only your smartphone along to make pictures. I know your camera is much bigger and heavier than your phone, but it can really perform much better than your phone on days like Halloween. It’s got better focus controls, better low light quality and it’ll give you a better perspective. Just buck up and bring the good camera — you won’t regret it next year when you look back at pictures. When you raise the ISO setting, your picture will have more noise/grain. But who cares??? That’s nothing to be afraid of and the result will be a picture that is sharp enough to discern your subjects. If you leave the ISO set low, then you’ll probably have to use a shutter speed that is so slow that the subjects will be blurry. A sharp photo with grain is far superior to a blurry picture without grain. This was shot at ISO 1600 and it was pretty dark before being brightened with software. But with expressions like those, who cares how noisy it is? Of course, you’ll photograph the kids as they set out trick or treating, but remember to also make pictures of the aftermath — that is, the counting of the candy. The kids will love to see the results and they’ll love to look back and see how they compared year to year. Plus, they will be glowing with happy results and it’s sure to be a good expression. This would also be a good time to try setting up lights and making a more intentional picture, a kind of environmental portrait with good lighting. Lastly, remember that the most important thing about the pictures you make is that you make them. Don’t worry if they are noisy and too dark: Just make a record for the memories. Not every picture needs to be art, and every picture of the people you love is a treasure.